How to look after your bike, in four easy steps - without any tools. "Just been out for a spin on my newly tuned bike - fantastic! Thanks guys for such an efficient, professional job with brilliant service - much appreciated. I will be recommending you to anyone I know with a bike!" The simple way to look after your bike. No tools required. It is assumed throughout that your bike is in general good order and correctly set up, for example it could be fairly new or have recently been through our system. Keep the tyres fully inflated. This should be a breeze, not a chore. If it lives outside, use it! Lubrication - little and often, less is more. Cables stretch. You can bring back the tension. You won't need any tools to follow these steps, just the four items detailed in full as you read on. If you'd like to buy the SCB care kit containing these four items, please click here for details. i) Pump up your tyres. The vast majority of the bikes that come into the workshop have tyres that are way below the correct pressure level. The single biggest positive impact you can have on your riding experience is having fully inflated tyres, and this will also have a knock on effect on other potential problems you might encounter. Properly inflated tyres are far less prone to punctures, and by absorbing bumps and shocks, they reduce wheel damage and make it less likely that your bike components will go out of tune. Pumping up your tyres should be a pleasure. It should take a few satisfying seconds to achieve, not many frustrating minutes to not achieve. Customers often seem in awe of us bringing their bikes back with properly hard tyres, asking, "how do you do that?" Well, it's not rocket science. There are just two factors to successfully pumping up your tyres. Firstly: Get a track pump. Achieving 40-100 PSI - that's forty to a hundred pounds of pressure per square inch! - with a flimsy hand held pump is a challenge to put it mildly, and often nigh on impossible. 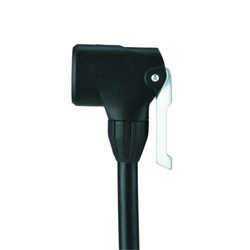 What you need is a track pump, also sometimes known as a floor or stand pump. Specifically designed to inflate bicycle tyres, they are of a good size and have a properly sealed air chamber. They also have a hose that attaches to the valve while you stand with two feet on the base and pump up your tyres with both hands firmly holding the handle. 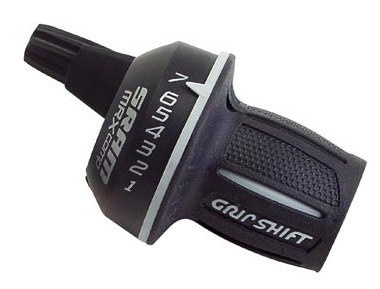 A gauge on the side enables you to confidently inflate your tyres to the correct pressure and a dual head on the end of the hose enables use with either type of valve. Now you may be thinking, "sounds great, but I bet they cost a fortune." Well, actually they don't. Of course like most manufactured goods these days, you can get poorly made, cheap versions that don't last, but for a reasonable price (£20-£40) you can find many fine examples. Here in the workshop we like Blackburn's - they're excellent quality and come with a lifetime guarantee. As I type this you can buy a brand new Blackburn Air Tower 1 online for £26 including delivery. That is a quality pump that will give you years of reliable use for a very reasonable price. I guarantee that if you buy one of these and work on part two, pumping up your tyres will become a pleasure. You might also wax lyrical about the days when everyone had a frame fitted pump and puncture repair kit in their saddlebag and fixed punctures by the side of the road. Suclassy it's better to carry a pump with you...? Well, if you get a slow puncture when you're on the road, then a frame or hand pump that you carry with you may enable you to get a bit of air in your tyres and thus enable you to get home. Often, though, if you get a puncture, the tyre goes down fast and any pump is pretty useless. (Of course if you do have tyre levers, tools, and a new tube or puncture repair kit on you, then that pump's going to help – but if you've got all that stuff and the skills to carry out the repair by the side of the road then you probably don't need to be reading this.) But prevention is better than cure and leaving with fully inflated tyres is one of the best ways to avoid punctures. Therefore it is much better to leave the house with fully inflated tyres than to need to pump them up when you're out. Secondly: Practise! It is a knack to attach the fitting on the end of the hose to the inner tube valve properly. It's not very difficult, but it is something you need to learn. With your two feet on the base, after a couple of strokes of the pump you will feel whether the valve is opening and air is flowing in, plus you'll be able to see it on the gauge. If it doesn't work, remove the attachment and try again. Look on the side of the tyre to find the correct pressure. Often this will be given as a minimum and a maximum, but this is just a guide. Learn what is best for you. Once you have mastered the technique, topping up the pressure in your tyres every couple of weeks will be a breeze. You will look back on the days when you struggled with a poor hand pump and wonder just what on earth you were doing. And riding your bike will be far more satisfactory too. Finally, bear in mind that tyres go down even if the bike is not being used. That's right, depending on the initial pressure, type and quality of the valve and tube, plus some other factors (temperature, where the bike is kept etc.) a tyre will go completely flat in about 3-6 months. ii) If it lives outside, use it. The enemy of a bike is water, especially the kind we get here by the sea. With its high salt content, it gets to work on a bike and will over time start to corrode many of the metal parts. There are a number of different things you can do to try to minimise or avoid altogether this problem. Lubrication really helps and we'll come to that next. Keeping the bike inside when it's not being used is the very best thing that you can do, but that's quite clearly not always practical and anyway, bikes are for using, not hiding away until the conditions are perfect. If your bike spends time outside exposed to the elements, try to take it for a good spin at least a couple of times a week and ideally more. Work through all the gears, and use the brakes. A good ride will dry out the bike, shaking off the moisture. Using the gears and the brakes will do the same for all the components and so stop them from seizing up. If your bike lives outside and you get a puncture, either have the puncture repaired very soon or bring it inside. Similarly if you're not going to be riding your bike for a while, try to bring it inside. When a bike lives outside and isn't ridden, all those lovely moving parts gradually corrode and seize up. There comes a tipping point after which many of the parts will be damaged beyond repair. 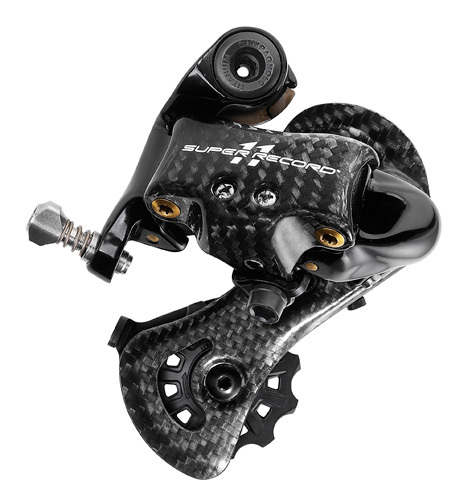 All is not lost – virtually any bike is repairable, but after this point it may well cost significantly more. So if your bike has to live outside, pump up the tyres, keep it in regular use and give it a bit of lubrication. It'll do you proud. 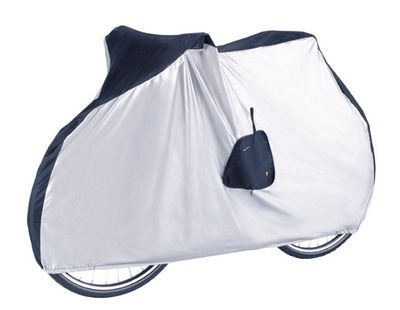 A quick word on covers and sheds: bike covers do a great job, but they are not as good as keeping a bike inside. The same is true for a shed, although generally to a lesser extent, depending on how well sealed it is. A bike kept under a cover outside but not ridden for months on end will still rust and potentially seize up due to the moisture and salt content in the air. iii) Lubrication – little and often, less is more. ‘Little and often’ is the way to go when it comes to lubricating your bike. Now I'm sure you'll be pleased to know that I'm not going to start discussing removing and stripping down parts, greasing bearings etc. I'm just talking about a quick bit of basic maintenance, the kind of lubrication you can do in five minutes, with no tools, removing no parts and armed with just your two products as detailed below and a bit of rag. Lubricants – ideally you need two types. 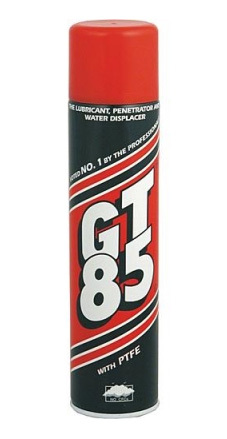 Bicycle chain oil for the chain and a PTFE based spray lubricant (we like GT85) everywhere else. PTFE contains Teflon and is great stuff, the ideal lubricant for a bike. Again these needn't break the bank. Both can be bought for just a few pounds and used sparingly will last a long time. Don't try to get away with just one or the other; you really do need both. There are many schools of thought on oiling, lubricating, coating and cleaning chains and some wondrous products to help you achieve these aims. I'm just going to keep it really simple. All you need are a few drops every so often. 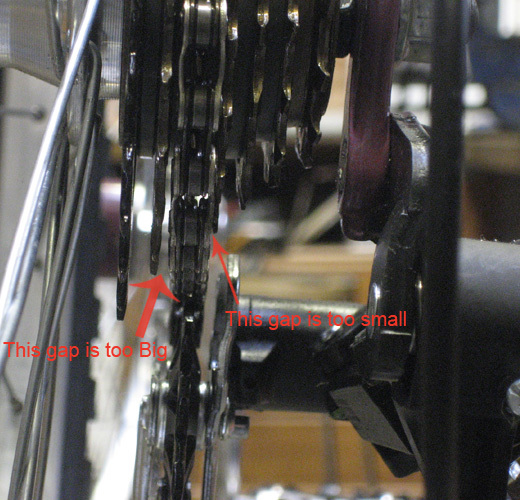 I like to do it with the bike stationary, dropping the oil onto the top side of the lower section of chain with one hand whilst turning one of the pedals backwards with my other hand to rotate the chain. Do not lubricate where your brake pads meet the wheel and especially not anywhere near disc brakes. This depends on various factors: how much use the bike gets and in what conditions, plus where it lives when it's not in use. A bike ridden occasionally, only on dry days, and that is kept in a well sealed dry garage when it's not in use will need very little. A bike ridden every day in all weathers, even if it lives inside when it's not in use, will need much more. Find the happy medium for your bike. Just remember: with lubrication, less really is more. iv) Cables stretch. How to bring back the tension. This last point is the most technical and might feel like one step too far for home maintenance, in which case please do leave it to us. But if you want to get the best performance out of your bike between services, it's well worth having a go. Over time, your inner gear and brake cables do stretch and the outer sections will also ‘bed in,’ though to a lesser extent. When we fit new cables, we always try to take as much of this out as possible, but with use further stretching can be expected. Let's assume that your bike's cables and tensioners - don't worry if you don't know what this means, we're getting straight to it - are all operating properly. 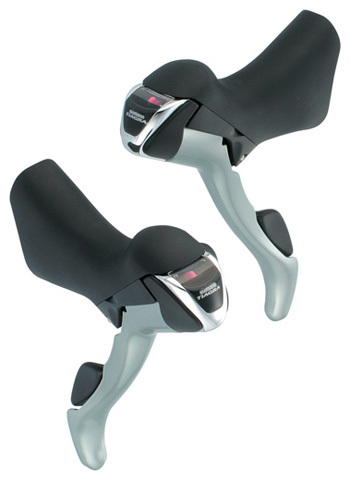 Shifters – You use these to change gear. 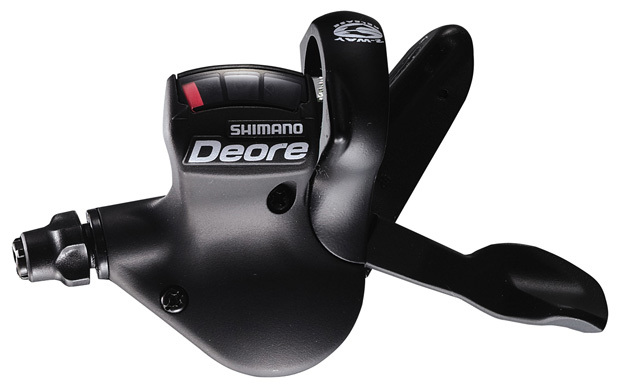 Rear derailleur – This amazing device moves your chain between the different cogs attached to your rear wheel. 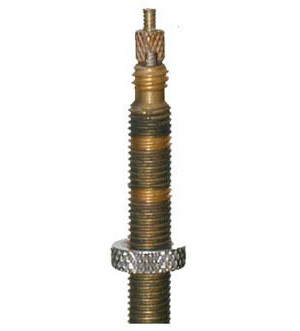 Cable tensioner – These allow you to classatively easily adjust the tension of individual cables. 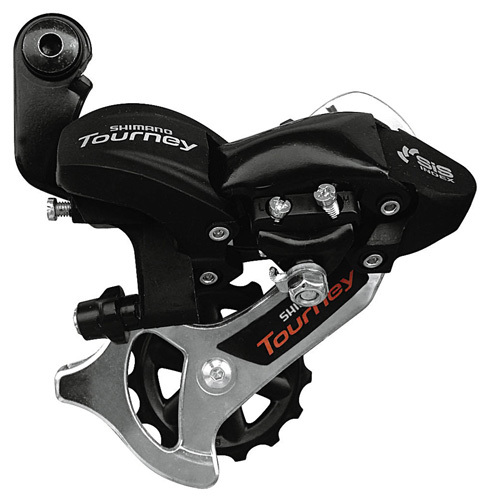 They are found where the cable goes into your rear derailleur and also often where it comes out of your shifters. 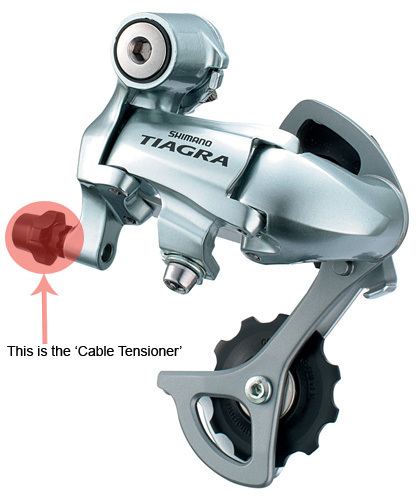 It must be pointed out that cable tension is just one part of setting up a gear or brake system. If the rest of it is incorrectly set-up or damaged, changing the cable tension will have little or no benefit. 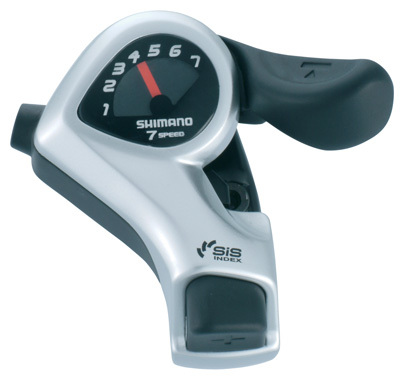 With indexed gears - where you ‘click’ to change - each click pulls a set amount of cable, which moves a derailleur (or other gear system) a certain amount. When the whole system is properly set up, this movement results in a clean, satisfying gear shift. As the cable stretches, the gears will gradually go out of alignment. This will happen to not just one gear, but all of them, as with each gear shift the next gear is out by the same amount, and so on. All is not lost, though. In every gear system, there is a way to adjust the cables, normally by simply turning a ‘cable tensioner’. By unscrewing them, you add tension to the cable and can thus retune the gears to compensate for cable stretch. The rear derailleur is the most used and therefore most often in need of fine-tuning. Look at it from behind (crouch down or get it up at eye level) so that you're looking in the direction that the bike travels. 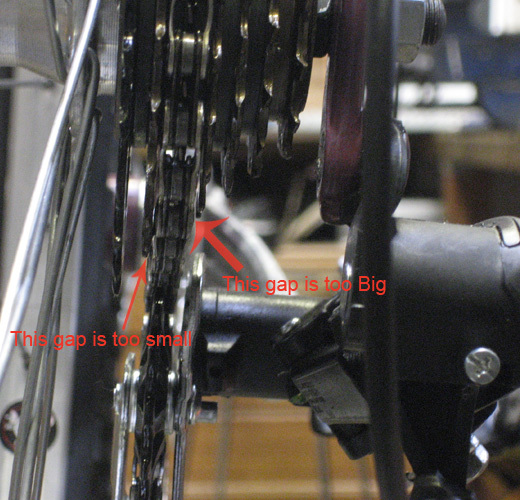 The two jockey wheels and the lower cage should hang down in a straight line directly below the corresponding sprocket (cog) on the rear wheel. As the cable stretches, the spring in the rear derailleur pulls it that bit further away and the jockey wheels now hang down between the sprockets. Turn the tensioner, though, and you can bring it all back into alignment. Ok... so it sounds simple when I put it like that and often that is all that is required. However, by working with the assumption that the cables and tensioners are working properly, we've ruled out a lot of reasons why is might not be this easy. 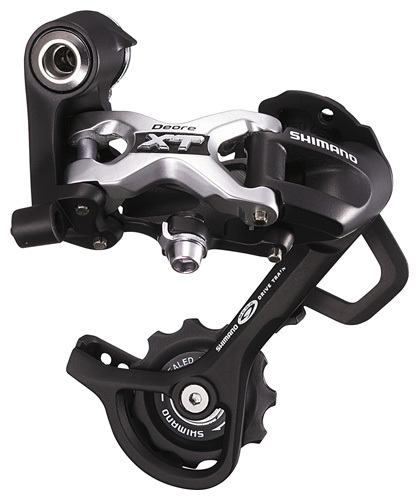 The rear derailleur needs to have its range, limits and alignment correctly set up; the shifters should be properly operational and not sticking; and all manner of setup with the transmission – the chain line, bottom bracket length and dishing of the rear wheel, for example - need to be correct. But don't let this scare you, because as long as your bike has been properly set up in the first place, then all these things will be just fine. Just remember that adjusting the cable tension is just one piece of the jigsaw. 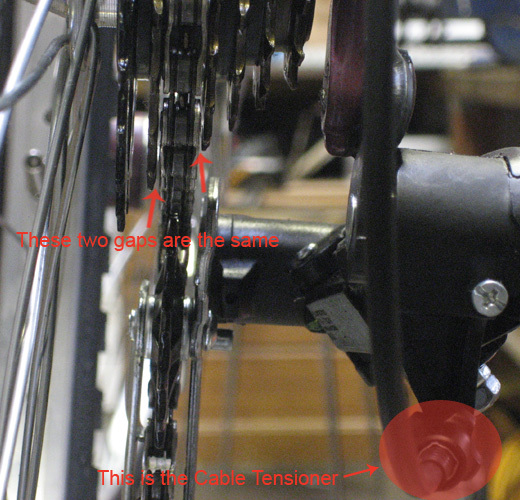 The following three images illustrate the effects of variations in cable tension. Click on the images for larger versions and further detail. Of course, general wear will occur no matter how well your bike has been set up. As you ride your bike and it is exposed to the elements, the components making up your gear systems will gradually become worn. Depending on their quality and the use the bike gets, they may last for many years or just a few short months. Achieving a classiable, enjoyable gear shifting experience with worn out components is not easy and it won't last very long, no matter how adept you are with a cable tensioner. Just like with pumping up your tyres, with a bit of practice you'll be able to bring your gears back into alignment without too much trouble at all. The only real consequence of your brake cables stretching is that you will have to pull the brake lever further before it has any effect. 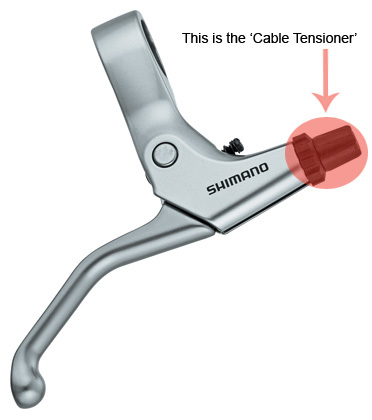 But by using the tensioners at the end of the brake levers (where the cable comes out of them) you can take up the stretch that develops in the cable. The tensioners found in brake levers are slightly different to their compatriots in shifters and derailleurs. They generally have an inner body and outer ‘lock ring’. You unscrew the inner body to add tension to the cable and then screw the outer ‘lock ring’ back into place against the body of the brake lever to secure the now adjusted tensioner in place. Please note, tensioners can only make so many turns before they try to unscrew themselves out of the body of the component that holds them. At least 1/3rd of the tensioner should be screwed in to avoid potentially quite serious problems like them snapping off and ruining the shifter. Exactly what I was looking for, very well explained in a simple way. Thank you. Good article thank your.my Cannondale has Discbrakes which stop me really well.have you any experience in cleaning the rust spots off the disks themselves.do I really need to clean them? Went out and bought track pump after reading this and its changed my life for the better(and bike!) Excellent article. Thank you. Lots of useful information. Thanks for sharing! I have learned more from this website in a few hours than I have in the 2 years I've been back into (commuter) cycling! I feel quite empowered - and eager to learn more. Thank you. Thanks, just happened upon your site and have now bookmarked it. I bought an old Muddy Fox StreetFinder today for 40 squid and it runs really well - so far! The only weird thing are the brake levers - they are strangely loose - the seller said they came like this....I am sceptical but think I can probably replace them pretty easily....any recommendations on what make or model I should get? Great article. Have returned to cycling and now commute part of the way to work. Middle aged so can afford the kit (!) but your ideas add to the priceless experience. At 65 I have come back to cycling after 35 years. I found your article, very interesting and informative. I never trusted the little rubber brake blocks so this time have gone for disc brakes, and would be grateful if you could, add more info on them. The information about how to keep tyres properly inflated has inspired me to learn to do this myself (pathetically, I have never managed on my own since handpumps and Woods valves disappeared). You did such a great job rebuilding my 1980 model bike, which I use every day,and this useful article shows how I can keep it running well. You give an excellent service, and the website reflects it. Amazingly clear ! very simple! definitely would recommend it to friends! It's been a great help to me! Very to the point and clear, thankyou. Fantastic information! Just what I need as a casual leisure rider who hasn't ridden a bike for over 45 years! Me and my hybrid appreciate your simple, complete insight to maintenance for a rider like me! Very clear and easy to understand, think i might still get a pro to sort out the gears on my bike though! Great literature here, being relatively new to cycling this will be a good start to properly maintaining my investment. Thanks for taking the time to provide this free information. Really easy and accessible information. Keep up the good work! Not a bad guide for beginners, quite useful. Having just returned to cycling (after a break of some forty years) with a new-ish Scott hybrid, I found the article really helpful as things like gears and brakes have changed out of all recognition with indexing, discs etc etc over the years. My bike must stay outside (with a cover) so the points on maintenance were particularly relevant - thank you, and I like the du-dums!! 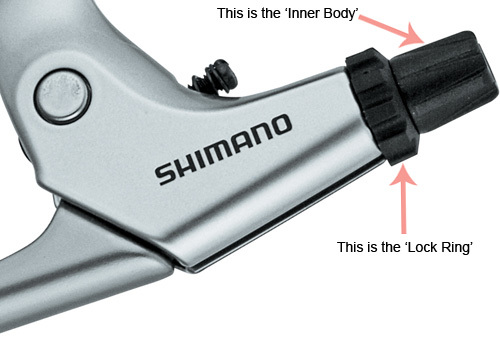 Really clear and concise information to help (in my case) the casual (but keen) hybrid rider. Brilliant! Thanks so much for this article, it's exactly what I've been looking for.